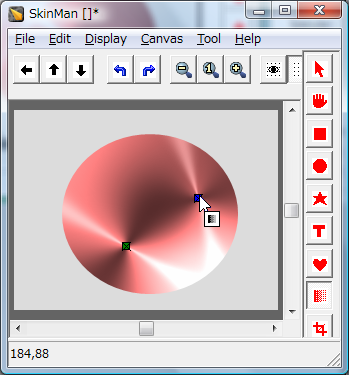 SkinMan can add effects of specular, shadows and so on. three types of reflection can be selectable. flat reflection, sphere reflection and round metalic reflection. Specular expression consist of the brightness of the primitive and white hilight. each expression is separately controlled. In addition, complete two sets of parameters are prepared. named light1 and light2. That makes available to more complex lighting. following picture is a sample of Flat+Metal specular. 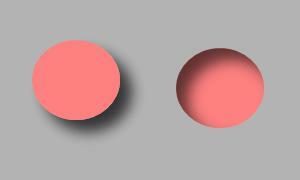 though the center position of the Specular is the center of the primitive in default, it is movable by Gradation tool with SHIFT-key / Control-key. the green rectangle handle with 'X' is the specular center for "light1", and the blue rectangle handle with 'X' is for light2. you can move these points by clicking with Shift/Control keys. 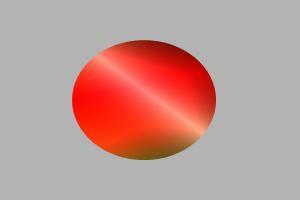 Specular effect is similar to the gradation, but the Specular can make reflection expression easier. 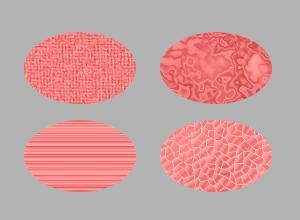 In addition, the Specular and gradation can make effects independently. that make more complex effects. 'Emboss' make a bevel to primitive edge. The negative value of the 'Depth' will make a depression edge. 'Texture' add a texture to surface of the primitive. You can add a new texture by yourself. Add any .bmp files to the 'Texture' folder under the SkinMan.exe. the file sould be a *.bmp file but not limited in picture-size. the image can be a colored image but the color is ignored. Add a shadow to the primitive. This group has two set of parameters. one is 'Drop', another one is 'Inside'. DropShadow will be dropped from the object to underlying objects or background. InsideShadow is a shadow dropped to the object. Color: the color of the shadow. the default is black. Direction: the direction of the light. 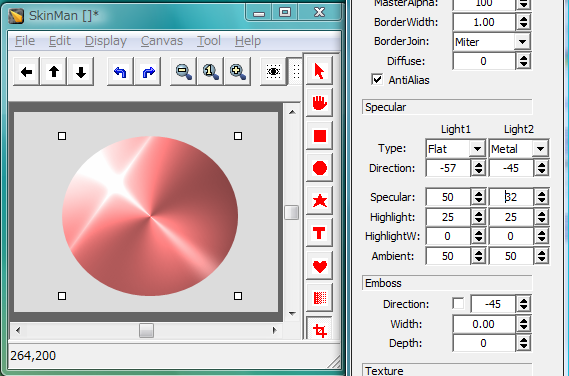 if not checked to check-box, the specular direction is used.